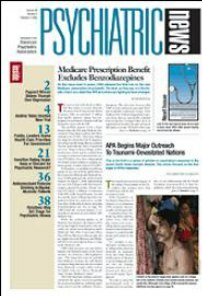 Keeping up with all of the new developments in psychiatry from multiple journals, as well as all of related recent sociopolitical events, has been made much more simple of late thanks to medical daily e-mail news services from Medscape (from WebMD), the American Psychiatric Association, and various other psychiatric publications. Often the headlines are more telling than the actual stories. Some of the headlines seem to blindly accept misleading conclusions of the type about which I blog frequently – although the publications do use the word “may” a lot so as not to imply that any conclusion is actually proven. Other stories clearly contradict these same very conclusions. Here are some of the recent stories that touch on issues discussed and debated in this blog, organized by topic. My comments are in italics. 10/2/12. Study: Screening For BD May Reveal Undiagnosed Anxiety Disorder. MedWire (10/2, Grasmo) reports, "Patients who receive a false-positive diagnosis during screening tests for bipolar disorder [BD] are likely to have an undiagnosed anxiety disorder," according to a study published in Dec. 1 issue of the Journal of Affective Disorders. For the study, "1534 patients attending the Black Dog Institute Depression Clinic completed the Mood Swings Questionnaire (MSQ)-46 and 852 also completed the Mood Disorders Questionnaire (MDQ)." Notably, "46% of MSQ-assigned false positives and 63% of MDQ-assigned false positives in the unipolar non-melancholic group had comorbid anxiety conditions." Patients with obvious anxiety disorders who have been misdiagnosed as having bipolar disorder are beginning to show up in my office with alarming frequency, often having been placed on a whole stew of inappropriate medication. Also, the MDQ is one of those totally invalid symptom checklists. 2/15/2013. Mania Symptoms Appear Similar For Kids, Teens. Medwire (2/15, Piper) reports, "The nature of mania symptoms appears to be similar in young people with bipolar disorder, irrespective of whether they occur in childhood or adolescence," according to a study published in the March issue of the Journal of Affective Disorders. The study authors did find, however, that "the only exception was the emergence of psychotic symptoms, including hallucinations and delusions, in adolescents with adolescent-onset of symptoms, but not in children with child-onset symptoms." The study also found that "mania symptomatology that was similar across 163 children with child-onset of symptoms (before 12 years of age), 94 adolescents with child-onset of symptoms, and 90 adolescents with adolescent-onset of symptoms (after 12 years of age) was characterized by 'activated/pleasure seeking' and 'labile and disorganized' behaviors." Question: Isn't it a surprising coincidence that the one symptom that actually might establish a link between some active children and bipolar disorder – psychosis – is almost never found in children, while on the other hand, symptoms suggestive of acting out are prominent. Answer: No. 12/13/12. Older Americans Concerned About Mental Health Care They Receive, Survey Finds. A survey released today of Americans aged 65 and older finds troubling gaps in the care these individuals receive for mental illnesses. Among the key findings are that 46% of seniors who are in treatment for a mental health problem said their provider did not follow up with them within a few weeks of their beginning treatment to see how they were doing and that 38% said that their provider had not discussed the possible side effects of prescribed medications. The findings are from a survey of more than 1,300 older adults conducted in November and published in a report by the John A. Hartford Foundation, which describes itself as "a committed champion of health care training, research, and service-system innovations that will ensure the well-being and vitality of older adults." In addition, 33% of respondents said their provider failed to discuss treatment options, 40% said there was no discussion of how long treatment might last, and 34% said they were not told what steps to take if their condition seemed to worsen. The survey also asked survey participants about their knowledge of depression. Judging from the responses, considerably more education is needed, particularly regarding the links between depression and overall health. For example, only 34% were aware that depression is associated with a substantial risk of heart disease, a link that has been described in multiple studies and reported extensively. The findings highlighted in red are indeed disturbing. If your psychiatrist fails to do some or all of them, please run away as fast as you can, and find another psychiatrist immediately. It’s amazing how some people keep wondering why there are so many more mentally ill people homeless on the street, and/or why they are crowding our jails. 12/26/12. Studies: Number Of US Inpatient Psychiatric Beds Shrinking. The Denver Post (12/23, O'Connor) reported that a report published last February in the journal Emergency Physicians Monthly found a 60% decrease in the number of psychiatric beds available for inpatients in the US between the years 1970 and 2002. Bed counts at hospitals run by counties and states plummeted by 90%, the article said. A 2008 study [pdf] conducted by the American College of Emergency Physicians revealed that Colorado has only 11.8 inpatient psychiatric beds per 100,000 persons, which appears to be one of the worst rates in the US. 12/27/12. Report: $4.35B Cut From State Mental Health Services Since 2009. The Huffington Post (12/27, Horowitz) reports, "In the past three years, $4.35 billion for services has been cut from state budgets across the country, according to a report by the National Association of State Mental Health Program Directors Research Institute." At the same time that "states are slashing funding for treatment, private care is getting harder to obtain. Mental health advocates say that the number of [practitioners] nationwide has decreased in recent years." 1/23/13. More Psychiatric Patients Forced To Wait In EDs Due To Cutbacks In Inpatient Beds. The Washington Post (1/23, Khazan) reports on an "increasingly common" problem for psychiatric patients nationwide, where mental health patients are "boarded" in hospital emergency departments "in part because of cutbacks in inpatient hospital beds." The Post explains, "As states trimmed their budgets in the economic downturn, resources for mental health patients were among the casualties." The piece notes, "For many patients suffering from psychiatric crises, this translates to longer waits in emergency departments, where they receive no treatment for days - and sometimes weeks - while social workers try to chase down open spots in psychiatric wards, doctors said." Here’s a bunch of evidence for the "safety" of amphetamine use - if they are legal, that is. If they are illegal, they are very dangerous. Interesting, since they all do exactly the same thing. 1/10/12. Psychotic Symptoms More Likely Among Meth Addicts. MedPage Today (1/10, Phend) reports, "Methamphetamine use makes hallucinations and other psychotic symptoms substantially more likely among addicts, particularly for those abusing other substances," according to a 278-patient study published online Jan. 9 in JAMA Psychiatry. "The odds of psychotic symptoms were 5.3-fold higher during periods of meth use (P<0.001)," researchers reported. "That risk was dose-dependent and further doubled by frequent marijuana or alcohol use," the study found. 2/4/13. Addictive Potential Of AD/HD Medicines Examined. On its front page, the New York Times (2/3, A1, Schwarz, Subscription Publication) reported that medications like Adderall (amphetamine, dextroamphetamine mixed salts) "can markedly improve the lives of children and others with" attention-deficit/hyperactivity "disorder [AD/HD]. But the tunnel-like focus the medicines provide has led growing numbers of teenagers and young adults to fake symptoms to obtain steady prescriptions for highly addictive medications that carry serious psychological dangers." Some doctors "skip established diagnostic procedures, renew prescriptions reflexively and spend too little time with patients to accurately monitor side effects." While "very few people who misuse stimulants devolve into psychotic or suicidal addicts...AD/HD practices can fail patients, particularly young adults." 1/10/13. Among Meth Addicts, MedPage Today (1/10, Phend) reports, "Methamphetamine use makes hallucinations and other psychotic symptoms substantially more likely among addicts, particularly for those abusing other substances," according to a 278-patient study published online Jan. 9 in JAMA Psychiatry. "The odds of psychotic symptoms were 5.3-fold higher during periods of meth use (P<0.001)," researchers reported. "That risk was dose-dependent and further doubled by frequent marijuana or alcohol use," the study found. 1/11/13. Dose-Dependent Relationship Found Between Meth Use and Psychosis Symptoms. There appears to be a large dose-dependent increase in the occurrence of psychotic symptoms during periods of methamphetamine use, according to a study published online in JAMA Psychiatry. Australian researchers found a 5-fold increase in the likelihood of psychotic symptoms during periods of methamphetamine use compared with periods of no use. The increase was strongly dose-dependent: individuals who had used methamphetamine 16 or more days in the prior month were significantly more likely to experience psychotic symptoms than those who had used the drug 15 days or less. The researchers looked at 278 participants aged 16 or older who met DSM-IV criteria for methamphetamine dependence but did not meet DSM-IV criteria for lifetime schizophrenia or mania. The main outcome measures were clinically significant psychotic symptoms in the prior month, defined as a score of 4 or more on any of the brief psychiatric rating scale items of suspiciousness, hallucinations, or unusual thought content. “Although psychotic symptoms appeared to be largely circumscribed to periods of methamphetamine use, the long-term effect of methamphetamine use on a person’s vulnerability to psychosis needs to be better understood,” the researchers said. For more information about the mental health effects of methamphetamine see Psychiatric News here. 1/28/13. Report: AD/HD Medication-Related Emergency Room Visits Up Sharply. The Los Angeles Times (1/25, Healy) reported in its "Booster Shots" health blog that a study found that between 2005 and 2010, "ADHD medication-related emergency room visits have more than doubled - from 13,379 in 2005 to 31,244 in 2010," with the increase being "particularly pronounced in those over 18." The data was "reported Thursday in an issue of the DAWN (Drug Abuse Warning Network) Report, published by the Substance Abuse and Mental Health Services Administration, an office of the National Institutes of Health." About half of the "stimulant-related emergency department visits --15,585 in 2010 - were for 'non-medical' use of ADHD medication: They were to treat stimulant-related effects in patients who either had not been diagnosed with ADHD and prescribed the drugs or in patients who were not taking the medication as prescribed." HealthDay (1/26, Preidt) adds SAMHSA administrator Pamela Hyde said in an agency news release, "ADHD medications, when properly prescribed and used, can be of enormous benefit to those suffering from ADHD, but like any other medication they can pose serious risks - particularly when they are misused." Cases for adults "rose from about 2,100 to 8,100 among those aged 18 to 25, from about 1,750 to 6,100 among those aged 26 to 34 and from roughly 2,500 to nearly 8,000 among those over 35, during the time period." The study found that the gap between males and females in the number of ER visits related to nonmedical use of ADHD drugs was narrowing. "In 2005, the numbers were about 3,800 for males and about 1,400 for females. In 2011, numbers reached 8,650 for males and about 6,900 for females." Medscape (1/26, Brauser) also covered the story. 2/8/13. Maternal Depression, Domestic Violence May Raise Kids' Risk For AD/HD. HealthDay (2/8, Mann) reports, "Preschoolers whose parents report depression and intimate partner violence may be more likely to develop attention-deficit/hyperactivity disorder (AD/HD) by the age of six." Furthermore, "young children with depressed moms may be more likely to receive prescription drugs to treat behavioral and mental health issues down the road," according to a study published online Feb. 4 in the journal JAMA Pediatrics. The study "included more than 2,400 children who were three years old" and their parents who answered questionnaires regarding domestic violence and personal depression history. So you mean some of the kids who are diagnosed with ADHD are in reality just reacting to chaotic families and not to video games? And they are not diseased? 2/12/13. Violent Video Game Proliferation Has Not Coincided With Spikes In Youth Violent Crime. On the front of its Science Times section, the New York Times (2/12, D1, Carey, Subscription Publication) reports, "In surveys about 80 percent of high school-age boys say they play video games, most of which are thought to be violent, and perhaps a third to a half of those players have had a habit of 10 hours a week or more." The Times notes, however, that "the proliferation of violent video games has not coincided with spikes in youth violent crime." In fact, "the number of violent youth offenders fell by more than half between 1994 and 2010, to 224 per 100,000 population, according to government statistics, while video game sales have more than doubled since 1996." The article describes contradictory research into how media violence and video games may affect behavior. 1/31/12. Non-Drug Treatments May Not Reduce Key Symptoms Of AD/HD. MedPage Today (1/31, Bankhead) reports that "nondrug treatments for attention deficit/hyperactivity disorder have limited evidence of efficacy and their use for core symptoms is not supported, a European guideline committee concluded." While "uncontrolled clinical evaluations produced positive results for a variety of dietary and psychological interventions," these "significant benefits disappeared in 'probably blinded' assessments, except for free fatty acid (FFA) supplementation and avoidance of artificial food color, according to" an article from the European ADHD Guideline Group published online January 30 in the American Journal of Psychiatry. MedPage Today adds, "Meta-analyses and systematic reviews have supported the efficacy of nonpharmacologic interventions in ADHD, but inclusion of nonrandomized trials and non-ADHD patients and outcome measures has complicated attempts to evaluate the interventions' effects on ADHD core symptoms, the committee members wrote." HealthDay (1/31, Gray) reports that the "multinational team of experts" involved in the study "identified no positive effects from psychological treatments including mind exercises (cognitive training), neurofeedback and behavioral training (positive reinforcement). And the researchers discovered only small benefits associated with dietary treatments: supplementation with omega-3 and omega-6 free fatty acids, and elimination of artificial food coloring." HealthDay notes that "according to the American Psychiatric Association, between 3 percent and 7 percent of U.S. children have" ADHD. Medscape (1/31, Cassels) also covers the story. Notice how exactly no non-drug treatments that involve intervention with dysfunctional families, or even talk therapies, were included in this study. The psychological treatments they do mention are of course totally inadequate and off the mark, yet the authors broadly conclude that no non-drug treatments are likely to be effective. This is what we refer to in logic circles as a Straw Man Argument. It is probably also true that if the authors did a similar studies on drug therapy, and the drug used was penicillin, that "drugs" would be shown to be ineffective as well. And finally, of course as we all know there is no evidence of a push by big Pharma to increase the number of ADHD diagnoses dramatically. Readers of this blog know that it can be extremely difficult determining which neuroscientific findings represent evidence of brain pathology and which do no. However, in the case of schizophrenia, the evidence of a miswired brain keeps on piling up. To me, this evidence is especially convincing since many findings - like oddly abnormal eye movements - involve brain areas that have nothing to do with hallucinations, delusions, or other symptoms of the disorder, and therefore would not be better accounted for by normal environmental conditioning of brain pathways through neural plasticity. And many of these phenomena are found in patients who have never taken an antipsychotic medication. (As if it weren’t already blatantly obvious that schizophrenia is a real disease to anyone who has spent significant time working with patients over time in a state mental hospital). 9/10/12. Can a new eye test detect schizophrenia? A mathematical model that assesses eye movements known to be abnormal in individuals with schizophrenia appears to discriminate schizophrenia cases from controls with near-perfect accuracy. The lead scientist was philip benson, ph.d., of the university of aberdeen in scotland, and study findings were published in biological psychiatry. "this is a very interesting study," l. Elliot hong, m.d., a professor of psychiatry at the university of maryland and a schizophrenia expert, commented to psychiatric news. "[however] the important next steps are [determining] whether these measures are specific only to schizophrenia or whether they can also separate different psychiatric diagnoses...." benson agreed. "we already know that the model can distinguish cases diagnosed with bipolar disorder [from those diagnosed with schizophrenia] with around 95 percent accuracy. We have preliminary data suggesting that major depressive disorder can also be distinguished [from schizophrenia], which is a tremendously exciting finding." 10/12/12. Meta-Analysis: Brain Volume Reduced In Patients With Schizophrenia. Medwire (10/12, Cowen) reports, "Medicated and antipsychotic-naïve [meaning that the patients have never taken these drugs] patients with schizophrenia show significant reductions in brain volume," according to a study published online Oct. 5 in the Schizophrenia Bulletin. "In a meta-analysis of data from 317 published studies," researchers "found that intracranial and total brain volumes were significantly reduced in schizophrenia patients compared with controls, after accounting for age, gender, duration of illness, and other variables." 12/13/12. Small Study: Relatives Of Patients With Schizophrenia May Show Cortical Thinning. Medwire (12/13, Cowen) reports, "Patients with schizophrenia and their unaffected relatives show significant cortical thinning compared with mentally healthy individuals without such a family history," according to a study published in the journal Cerebral Cortex. Researchers arrived at that conclusion after having "used magnetic resonance imaging to assess cortical thickness in 25 patients with schizophrenia, 29 of their first-degree relatives, and 37 age-, gender-, and parental education-matched mentally healthy controls without a family history of schizophrenia." 2/12/13. Researchers: Mice May Be Poor Models For Studying Some Human Ailments. The New York Times (2/12, A19, Kolata, Subscription Publication) reports, "For decades, mice have been the species of choice in the study of human diseases." However, in a study published in the Proceedings of the National Academy of Sciences, "researchers report evidence that the mouse model has been totally misleading for at least three major killers - sepsis, burns and trauma." The study's "authors said" the findings "raise troubling questions about diseases like the ones in the study that involve the immune system, including cancer and heart disease." Bloomberg News (2/12, Lopatto) reports that some "explanations for the discrepancy may be that the model mice are too inbred to be useful, or that the modeling doesn't reflect the illnesses experienced by trauma patients." Moreover, "the difference in recovery time between mice and people may play a role, and clinical care, such as drugs, surgery and life support, may further attenuate similarities." Or it could be that rats do not have much capacity for reasoning. Rats who are turned into alcohol addicts, after all, never hide the bottles. 2/14/13. "Helicopter" Parents May Make Their College-Aged Kids Depressed. Reuters (2/14, Goldsmith) reports that according to a study published in Springer's Journal of Child and Family Studies, helicopter parents who overcontrol aspects of their university student children's lives may be causing the young people to become depressed. Researchers arrived at this conclusion after analyzing survey results taken from 297 undergraduates from US institutes of higher education. 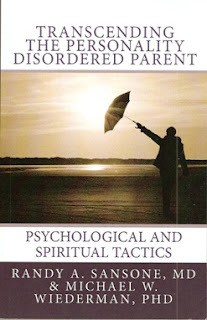 Book Review: Transcending the Personalty Disordered Parent: Psychological and Spiritual Tactics. Self-help books for the adult offspring of highly dysfunctional, personality-disordered parents are in woefully short supply. Children raised in such households often grow up to have high emotional vulnerability, a poor self image, and a high degree of confusion about what kind of people they are supposed to be or what they should expect from their relationships. Worse yet, they sometimes become just like their parents in some way, even if they try to do things in an exactly opposite way. If they do not have access to a therapist for whatever reason, is there anything they can do in order to better understand what has happened to them, and how to think about the problems that have resulted from their bewildering and traumatic upbringing? In a new book, academic psychiatrist Randy Sansone and academic psychologist Michael Wiederman attempt in ordinary language to help such individuals recognize the dysfunctional parenting styles they had been subjected to, and to understand a little bit about what makes their parents act the way they do. · They act like monsters with their family members, but are liked and highly-respected outside of the home - creating an almost Jeckyl and Hyde situation. · They seem to think that their children should be taking care of them - but undermine any effort the children make to actually try and do so. · They seem to see children a big burden, yet won’t them go. · They pit one of their children against another, creating even more widespread family discord. · They accuse their children of the very negative traits that they themselves display in spades. · They seem to over-react to seemingly minor transgressions made by family members, and in response become abusive and bullying. · They seem to be in a constant state of denial about past misdeeds. Or are they maybe just lying about it? · They oscillate between intruding on the lives of their children when they don't need help, and neglecting them when they do. The authors go on to suggest ways in which readers who have grown up with parents like these can conceptualize and think about their family experiences. Although they do not cite her by name, many of their recommendations seem to stem from the concepts of “mindfulness” and "radical acceptance" that come from the work of Marsha Linehan with personality disordered patients. These ideas involve the adult children giving up trying to completely make sense of their dysfunctional parents, completely accepting their situation as it is, stopping efforts to make their parents change, and viewing their experiences as an opportunity for growth rather than as an obstacle to it. As I mentioned, there is a serious need for a book like this, and I applaud the authors for their efforts. I also think many of their suggestions are indeed helpful, especially for those who are not seeing a family-systems oriented psychotherapist for whatever reason. I do, however, have some quibbles with their explanations for the personality disordered parents, and I frankly strongly disagree with a couple of their recommendations. The authors do try to be somewhat empathic with the plight of the dysfunctional parents, but their descriptions of them, understandably, veer away from that. The authors could benefit from an understanding of family systems theory. They come ever so close to Murray Bowen’s three generational understanding of the origins of self-destructive behavior, but just miss it. For example, they discuss how the reader may have been given what Transactional Analysts call a “script” by their parents – in which the recipients of the script act out in ways that seem to be for the benefit of their parents at the expense of their own happiness. The authors do not mention, however, that perhaps the dysfunctional parent is also the unfortunate recipient of such a script from the grandparents. In the same vein, the authors, like Marsha Linehan herself, mix up the personality disordered parent’s true self with his or her false self or persona. Is the exemplary behavior seen by outsiders the "true" nature of their personalities, or is it within their hidden-from-view dysfunctional family behavior? This issue is somewhat analogous to my problem with Linehan’s idea of apparent competence – that somehow people can demonstrate through performance an ability they do not in fact have. How is that possible? One father who they describe was a physician who was loved and idealized by his patients, but treated his children like crap. The authors seem to assume that the father’s “real” personality was the one he exhibited at home, while the one he exhibited at work was a fraud. Could it not be in fact the other way around? I disagree with the authors recommendation that children of dysfunctional parents give up the idea of ever truly understanding their parents' behavior. I believe that through the use of three generational family histories called genograms that it is indeed possible to understand parental misbehavior (which, BTW, does not entail approving of it). The authors also seem to be saying that nothing will ever change in their relationship with their parents, and that there is nothing the child can do about it. Those who read this blog know that I believe that, while adults (not children) are indeed powerless to change their parents, they certainly do have the power to change their relationship with those parents. The authors concluded that the mother lacked the ability to validate her daughters feelings. The daughter therefore would never be able to get this validation, for which she longed. I completely disagree. Let’s look at what happened in more detail. First of all, the daughter called the mother when the mother was intoxicated. I understand that it might be difficult to find a time to call when she was sober, but that fact alone guaranteed that the daughter would fail in her efforts to obtain validation. Second, I suspect that the way that the daughter brought up the molestation made it obvious to the mother that the daughter was highly critical of the mother’s lack of responsibility - as obvious as that lack of responsibility was. To the both of them, I might add. When anyone is attacked, they tend to respond with defensiveness, flight, or a returned attack. This is especially true in this case since I would wager that the mother really did, covertly, feel terrible about what she had done, and believed that the daughter was right to hate her for it. Furthermore, I find that such parents feel they deserve hatred, and that their children are really better off without them. Mother therefore responded in a very hateful manner, which very helpfully gave the daughter more righteous justification for her hatred, and pushed her away to a place in which the mother viewed the daughter as safe from the mother’s pernicious influence. If this daughter really wanted validation, she went about asking for it in exactly the wrong way, and the horrific response was entirely predictable. Not that the right way is something easy to devise or to do, or that the complicated techniques that do in fact work are obvious. And this problem is further complicated by the fact that the right approach is different in every family and must be customized to each family member's sensitivities. Generic assertiveness skills are often useless. Confronting maladaptive family patterns may in fact be extremely dangerous if done poorly. It almost always requires the coaching of a therapist who does this sort of work. As I have said repeatedly in this blog, finding such a therapist is well worth the effort. In unified psychotherapy (my model for the psychotherapeutic treatment of chronic anxiety mixed with depression, repetitive self-defeating/self destructive behavior patterns, and ongoing overt family discord), it is often difficult for a therapist to help patients to quit focusing just on themselves and to start thinking about the interpersonal and family context in which their problems take place. If they have had previous therapy in which a therapist acted as if their problems existed solely within the confines of their own heads, the major switch in frame of reference may be particularly problematic for them. 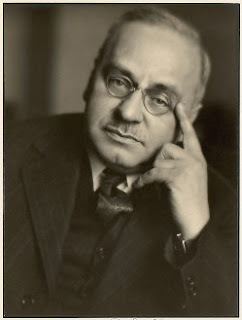 The psychoanalytic pioneer Alfred Adler devised a question that a therapist can pose to help a patient make this transition. He was the first to see the great value in asking patients the following: If somehow by magic the problem you have described were completely solved, what negative consequences might ensue? This question, or variations of it, have been adopted by several different psychotherapy treatment models, including family systems therapy, solution-oriented therapy (the “miracle question,” of DeShazer), and brief therapy (Gustafson’s Complex Secret of Brief Psychotherapy). In unified therapy, the question is designed to trace the adverse consequences within the patient’s family of origin that might occur should the patient stop self-destructive, self-defeating, or spoiling behavior patterns. To almost any problem a patient presents, there is a conventional solution that seems obvious - so obvious in fact that the therapist should assume that the patient has already thought of it. This is especially true if the therapists thinks of the solution almost immediately. If it that obvious, the patient has thought of it too, and has also no doubt been advised about it by several other people. It still amazes me how stupid some therapists think their patients must be to not have seen it. Presentation by the therapist of such a “solution” to a patient with a personality disorder invariably leads to a game of "Why don't you - yes but." The patient presents a series of lame excuses why they cannot employ the obvious solution, or why it will not work for them. Rather than do that, I ask a patient "If I had a magic wand and I could magically make this problem go away, what would be the downside?" Examples are: "If somehow you could get over your fear of asking nice women out, what additional problems would that create?" and "Everyone is probably advising you to tell your father that your career is none of his business. I wonder if something bad would happen if you did that?" If the patient is initially confused by the question, I might ask the patient to visualize having successfully overcome the problem and then ask, "What's wrong with this picture?" Alternatively, I may ask the patient directly who might be affected negatively if the patient were better adjusted. If you try this, you obviously have to be honest with yourself and try not to be defensive, and think about the answer for a while. Do not let your mind drift off. The answer will reveal which family relationships you need to change, and if you are seeing a therapist, where your focus should be in your treatment. 1. "I'd just find some way to mess things up." The magic wand won't let you do that. 2. "It would just affect me, and I'd be a nervous wreck!" The reason you would be nervous is because of the consequences to other people. What are those consequences? 3. "I can't even imagine it." Really? You can imagine anything. You can picture yourself flapping your arms and flying. If you “cannot” picture something, that just means you are afraid to think about it. What is your fear? Be courageous and think about it anyway. It won’t kill you, I promise. 4. "That would never happen." Remember, it's a magic wand, so it already has happened. To illustrate subtle variations of these non-answers: My patients sometimes tell me that the negative consequences of solving the problem would be an alteration or escalation of their self-destructive or self-defeating behavior. An example is "If I got up the nerve to ask a nice girl for a date, I would probably end up making a fool of myself over dinner." All this means is that the patient, if deprived of his or her usual ways of playing out a family role, would merely find another way to act it out. It avoids the question of why the patient is playing the role in the first place. I would counter with, "What would be the downside if you were able to have a totally successful relationship with a nice woman?" Another example of an unacceptable answer is, "If I started dating really nice women, I'd start picking at my skin until I bled". Again, what might be creating the anxiety that leads to this in the first place? In cases in which the negative reaction the patient fears comes primarily from a spouse or partner, and the patient seems to be avoiding an obvious solution to the couple’s problem, then I want to know about the downside of solving that problem. I would wonder who in the patient's family of origin might be negatively affected if the patient were somehow magically able to have a happy marriage. Sometimes the Adlerian question brings an immediate answer that sheds profound light on a patient’s family dilemma. One patient told her therapist about how she made herself miserable every day at work by constantly thinking up and worrying about catastrophic occurrences that could take place that day. (Of course none of them ever came to pass). She did this knowing full well that the scenarios she thought up and feared were extremely unlikely, so cognitive therapy would be useless in getting her to stop. In asking yourself this question, it is helpful to understand what the real answer to the question might look like. These feared consequences should be plausible, probable and serious. For example, your mother might get seriously depressed and suicidal, or your parents might divorce. Sometimes my patients respond with the notion that they really do not care what happens to their families, and that their motivation for maladaptive behavior is really selfish. Unfortunately, there is an obvious logical contradiction between self-destructive behavior and selfishness. Some behaviors such as destructive rages or over-eating can be made to look gratifying if you don't think about them too much, but the experience of them, not to mention their consequences, is anything but. You are too intelligent to be unaware of this. The only "selfish" motive behind self-destructive behavior is your wish to avoid the anxiety associated with watching your family members suffer. Another counterproductive response is to flagelate yourself for being a patsy. I personally believe strongly that caring and concern are good things. Perhaps there is a better way to express them than sacrificing yourself on the family altar.